An indoor fitness room and climbing wall. An open “learning-commons” library that connects to a community gathering space. Foods, fashion and woodworking labs. These are some of the spaces designed for students and community who will use the new Ivor Dent School, a K-9 school opening on 32 Street and 111 Avenue in the Rundle neighbourhood. Students from nearby and elementary schools and junior high school will shift to the new school when it opens in September 2017. School district officials and Group2 Architecture Interior Design Ltd. worked closely with principals from the three schools to design a building that really fits the community’s needs, said Terri Gosine, director of the District’s project management office. 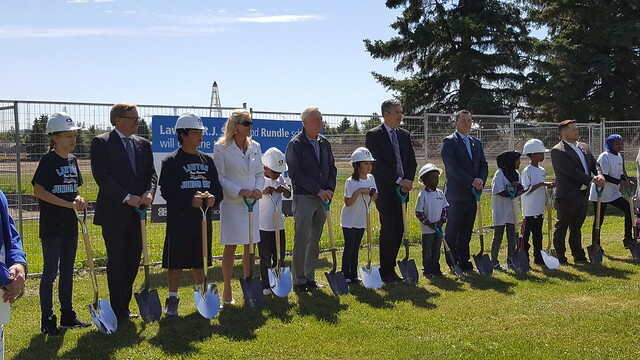 Ivor Dent School is the culmination of hundreds of hours of consultations between Edmonton Public Schools, city and provincial officials and community members in the Greater Lawton, Rundle and Beverly Heights areas. The District has started similar consultations in other mature communities – Britannia, Rosslyn and Westlawn – as part of a larger infrastructure review that’s examining older schools across the city for the next several years. The District is working through its Space for Students initiative to balance maintenance on aging buildings in mature neighbourhoods with the pressing need to build new schools in fast-developing suburbs. Data in a recent student-demographic study done by an independent consultant reinforced the need for long-term infrastructure planning, said Edmonton Public Schools Superintendent Darrel Robertson. The study shows the rate of student growth in mature neighbourhoods, even with planned infill development, won’t justify modernizing or replacing all existing schools, Robertson said. But there’s lots of opportunity to make sure those buildings continue serving their communities, he said. In northeast Edmonton, the community embraced the plan for a replacement school. The District is now reaching out to community groups and working with the city to fill the Rundle, R.J. Scott and Lawton buildings with programs and services that will enrich the surrounding neighbourhoods. “At the end of the day, we have happy parents, happy community, great learning space for decades to come and we’re able to deal with a lot of that deferred maintenance that we have in our older buildings,” Robertson said. Watch this video for a peek at some of the architectural designs for the new Ivor Dent School, hear what the community thinks, and find out why Edmonton Public Schools Superintendent Darrel Robertson hopes the project will be a model for other mature communities.